Andrew and Lauren Brown’s goal is to bring Natural Movement education to our elders. In addition to Private Training sessions that we give to people of all ages for both fitness and rehab purposes, including Seniors, we also teach classes in places such as Churches, Seniors Centers, and Assisted Living Facilities. As we age, our physical fitness and ability to move comfortably through environments, both natural and man-made, tends to decline. There are many reasons for this, such as lifestyle choices, previous or current injuries, a growing fear of movement, as well as deteriorating muscle, bone, joints, and connective tissues. We slow down, but in our culture in particular seniors are also often living separate from our larger families and communities, which reinforces the tendency to be “shut-in”. Being shut in removes our elders further from environments that require movement complexity and adaptability: further deconditioning them from being able to move well, and making them more prone to further injury, deterioration, and fear of movement. Although conventional fitness methods can help us maintain some of our basic conditioning and isolated strength, they tend to miss the most fundamental aspect of fitness itself: complex movement skills in relationship to living, and the conditioning, coordination, and strength that go along specifically with adaptive movement. Three primary elements of human movement neglected in the fitness world for instance are our ability to get up and down off the ground, our general ability to balance our body when our balance is challenged by the environment we are in, and the ability to react quickly so as to prevent ourselves from falling and to maximize safety if we do fall. Developing and maintaining these skills and the conditioning, strength, and coordination specific to them requires practical, scalable, and proprioceptive movement training. 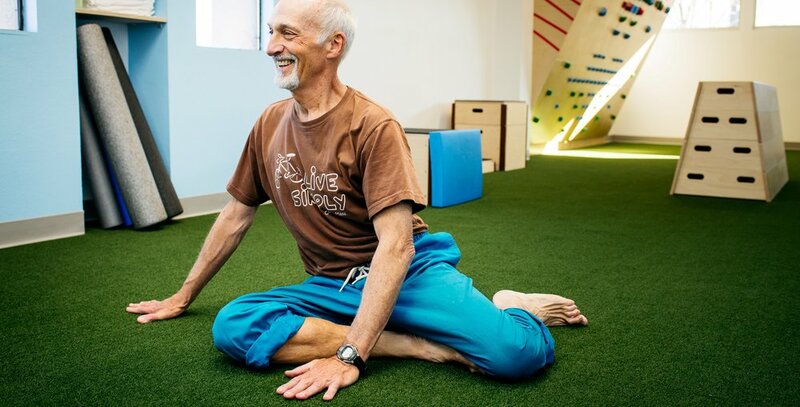 Natural Movement training for seniors goes beyond these elements to include movements ground positions and transitions, crawling gait patterns, like lifting, carrying, grasping, hanging, and movements in combination, such as carrying while balancing. These classes employ the Natural Movement Fitness methodology of MovNat®, a broad system of movement education and fitness training created by movement expert and author of the best-selling book, The Practice of Natural Movement, Erwan Le Corre. Although these classes themselves can be a resource for seniors, another benefit of the training is the process of learning how to implement and progress these movements into daily life, safely, by adding environmental complexity to our home environments using simple tools. Andrew Brown has been a practicing Manual Therapist in the field of Structural Integration (Rolfing) for 13 years, a founding member of the manual and movement therapy group Embody Birmingham for 6 years and has been a (Level 2) MovNat Certified Trainer for 4 years. Lauren is also a practicing Manual Therapist with several specialties including Manual Lymphatic Drainage therapy and is also a Yoga instructor (RYT-200). Andrew and Lauren combine their experience of working with primarily middle-aged and older individuals with injuries and movement restrictions in their manual therapy practice with his Natural Movement teaching. Andrew’s and Lauren’s work can also be found at www.RolfingBirmingham.com, www.LaurenRaeBrown.com, and www.EmbodyBirmingham.com.